Cathy Holloway Hill is a successful business woman, motivator, host of the Living By Design TV and Radio shows, and author of two previous books, ‘Emotional Bailout’, and ‘Lies, Love and Life’. As a talk show host she has had the privilege of meeting many well-known and celebrated women, and one she holds in great esteem is the late great Dr. Maya Angelou. This incredible woman, who achieved so much in her life, impacted the author greatly, and her words became the backbone to the investigative work in this book. The Foreword is the author’s interview with Dr. Angelou. This informative and motivational book looks frankly into the reasons why some women struggle with their relationships with other females. We are a product of our upbringing and culture, the influences of mothers, siblings, peers, etc. shape us. Life experiences, observing the reactions of others to things we do, childhood memories, the households we were brought up in, and the dynamics of personal relationships continually affect us, and mould us as the person we are today. However, the author encourages her readers to look inside themselves and ask if they are really the person they want to be? Are they happy, or do they long to change, to be more confident about the way they look, or what they have achieved? Do they yearn for a successful career, but are not confident enough to pursue it? Cathy Holloway Hill truly empowers her reader. 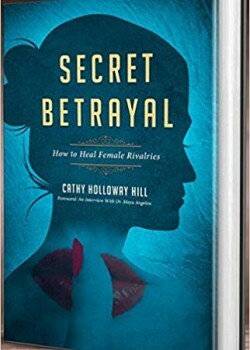 She does this by examining the reasons why women act as they do towards each other, and why they feel the need to compete, gossip, backstab, judge and betray. Then, armed with this knowledge, she shows us how we can change. Each woman’s path must be walked alone, and each will be different. Her goal in this book is to connect women, and promote positive change for girls and women worldwide. She does this by giving us the confidence to discover inner peace, own our unique identity, and become the woman we want to be. At the end of each chapter, the reader is given a review of its contents and the opportunity to write down the changes they want to make. Also, at the back, there are four excellent appendixes, including Self Reflection Questions, 12 Week Self Improvement Program, Resources (Books, CDs, DVDs and Downloadable MP3s, and Daily Affirmations.